On Tuesday, Jan. 3, members of the Pennsylvania House of Representatives were sworn in for the 2017-18 legislative session. Rep. Rosemary M. Brown (R-Monroe/Pike) took the oath of office for her fourth term representing the people of the 189th District. She is pictured here with her husband, Joe, and their children, Kennedy, Carter and Reagan in the Capitol’s Main Rotunda. 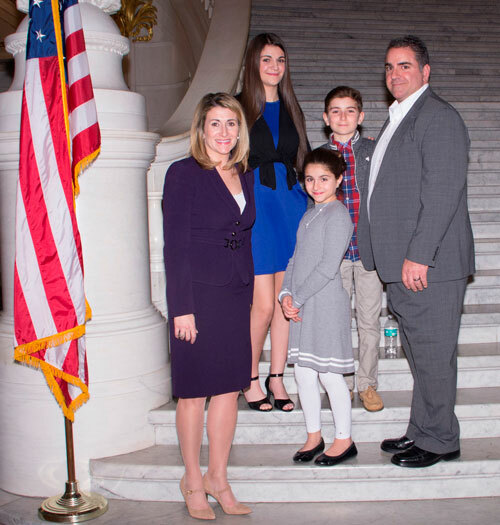 “I thank the people of the 189th District for the privilege to represent them in the Pennsylvania House of Representatives. The constituencies I proudly serve include family members, friends, neighbors and members of the community in the northeastern region of our state, a place which I am proud to call home. It is an honor to work as a public servant at the state level and be a voice of the people when taking action on our state’s most pressing issues, including addressing the high cost of property taxes. “Looking ahead at the legislative calendar, the annual state budget crafting process will also be beginning soon. At a time when our Commonwealth continues to face difficult fiscal realities, it is imperative that we take steps to ensure that every cent of taxpayer money is used in a responsible manner. I believe we need to strengthen the foundation in which our state budgets are built. Instead of assuming more money will be spent year after year, we should take a more in-depth look into each and every department. I sponsored a bill last session that called for departments to provide efficiency reports to push this initiative. I plan to reintroduce a similar piece of legislation this year.